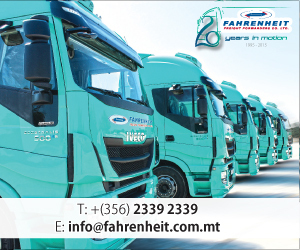 Where all the magic happens. A 6-tonne set-up to be carried up into the air by a 128 tonne crane. 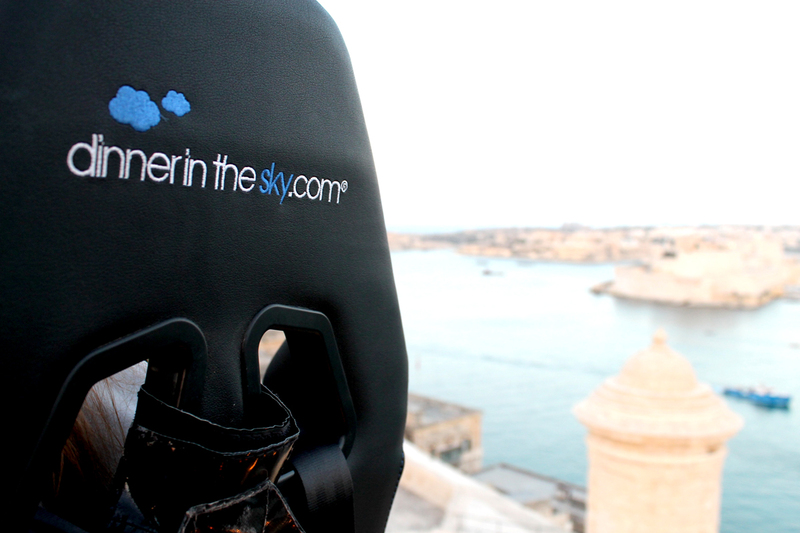 Dinner In The Sky is not for the fainthearted, but certainly well worth gritting your teeth and experiencing. The sumptuous table of 22 place settings is elevated twice an evening to 40 metres above Grand Harbour, and a fine dining menu is served to the excited guests. The team from VIDA Magazine were invited to join the Press Launch and experience the adventure for themselves. Our talented chefs for the night! 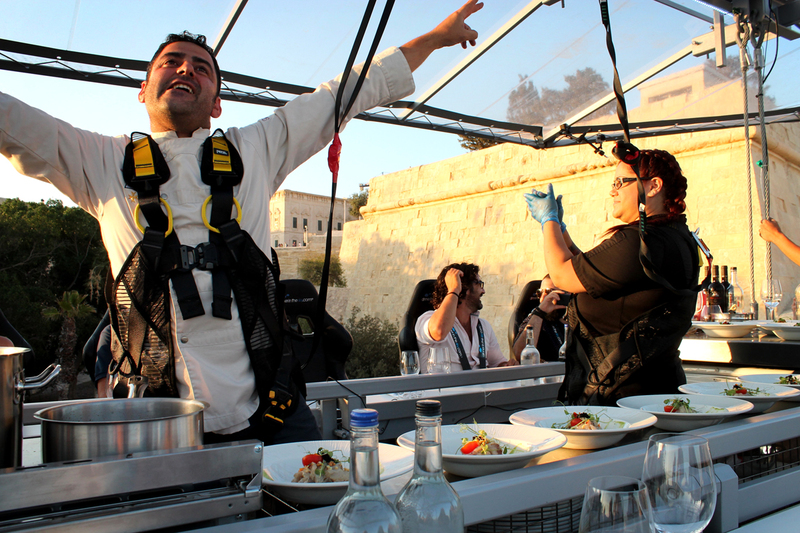 On the left, the eccentric Marvin Gauci, owner of Caviar and Bull and Tarragon, pumping the guests up as we ascended into the air. 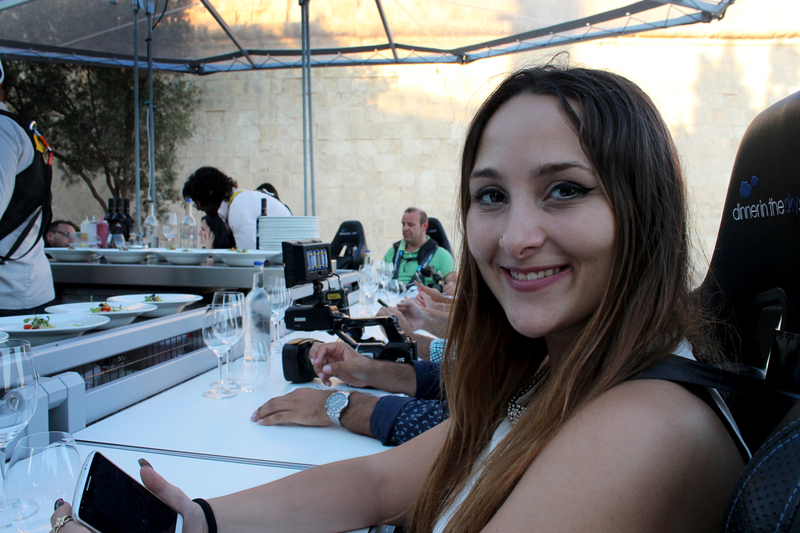 On the right, Maria Sammut, the leading chef of the night, had a fitting calm and soothing aura about her; the perfect attitude for serving guests 40m up in the air. Guests were called in two by two in order to be individually strapped into well-secured and harnessed chairs by security personnel. Guests also had the opportunity to swivel around in chairs throughout the duration of the event in order to see surrounding views. Thea Formosa, one of VIDA’s content writers, with an excited grin on her face; photo was taken a few moments before ascending into mid-air. She was also the first one of the group courageous enough to recline her chair backwards into the air. 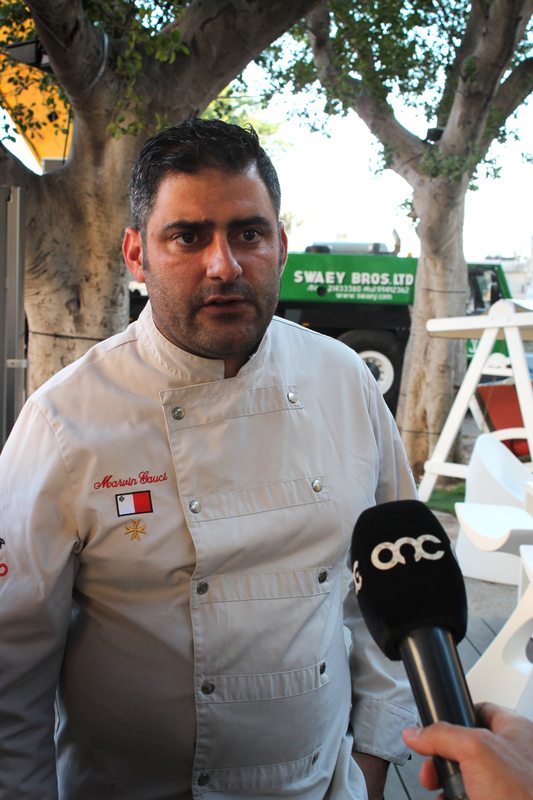 Marvin Gauci, one of the master-minds behind this event, explaining the challenges and triumphs he experienced in the process of setting things up, and answering the press’ questions before they were directed towards the dining table. 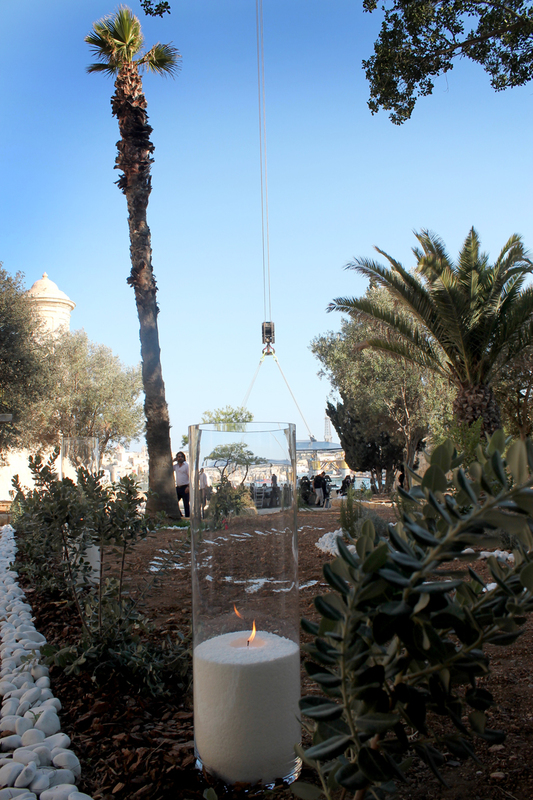 Stunning and completely cruelty free hand made candles by Inspiring Exclusivity, a Germany based company. Your eyes are not deceiving you, the candle is as big as it looks. A sumptuous sunset starter. If you are concerned that Dinner In The Sky is merely a gimmick with average food, you would be very much mistaken. 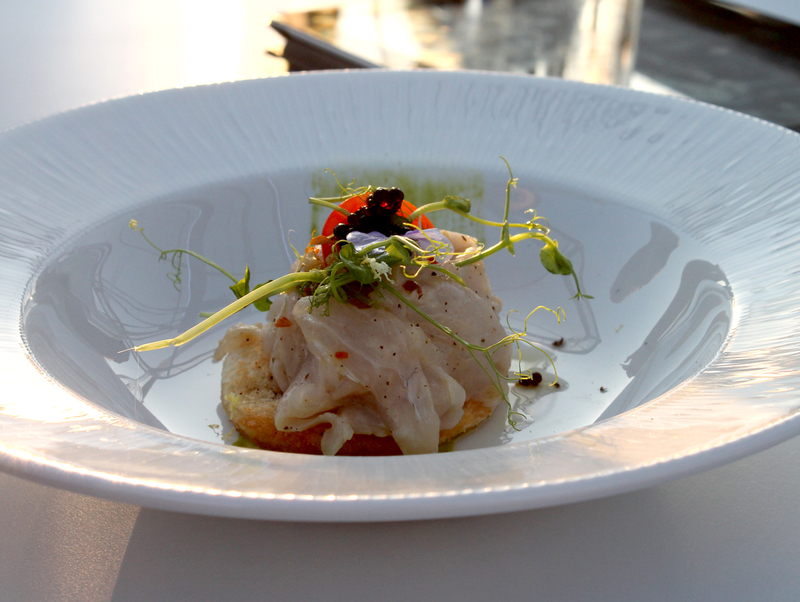 The event is spectacular, but the menu is equally as impressive. 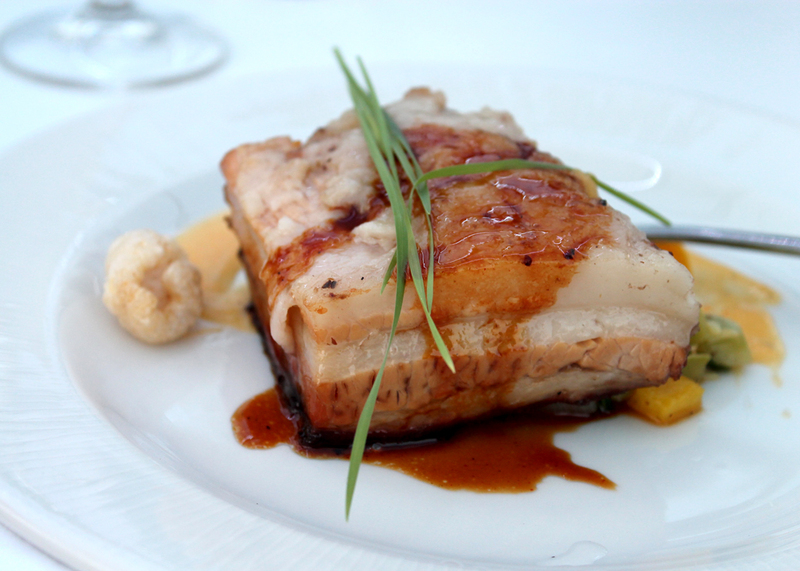 The Main Dish: slow cooked pork belly together with potato and carrot mash, Bok Choy, Sweet peppers and marrow bake, topped off with wheatgrass and a scrumptious apple cider sauce. Heavenly. The dessert: a piece of culinary art created up in the air. 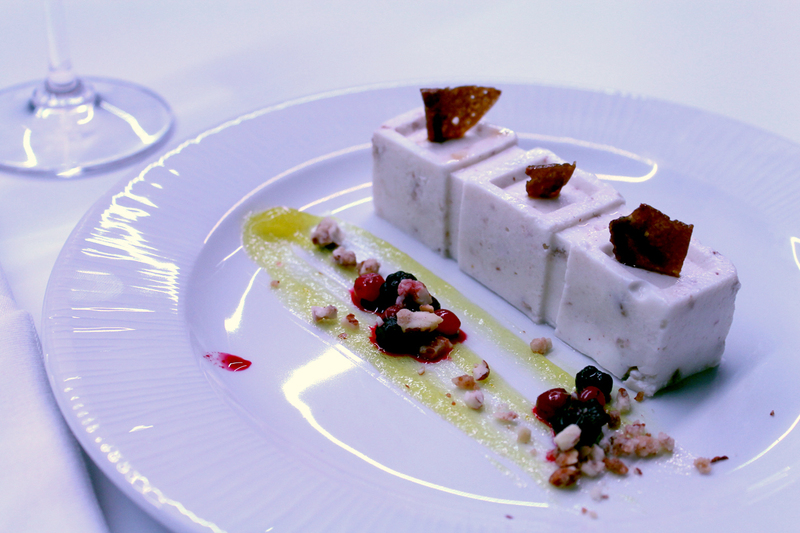 Almond panacotta with lemon gel and Frutti di Bosco together with Almond Croquant as garnish. The sunset view over Grand Harbour is nothing short of spectacular. 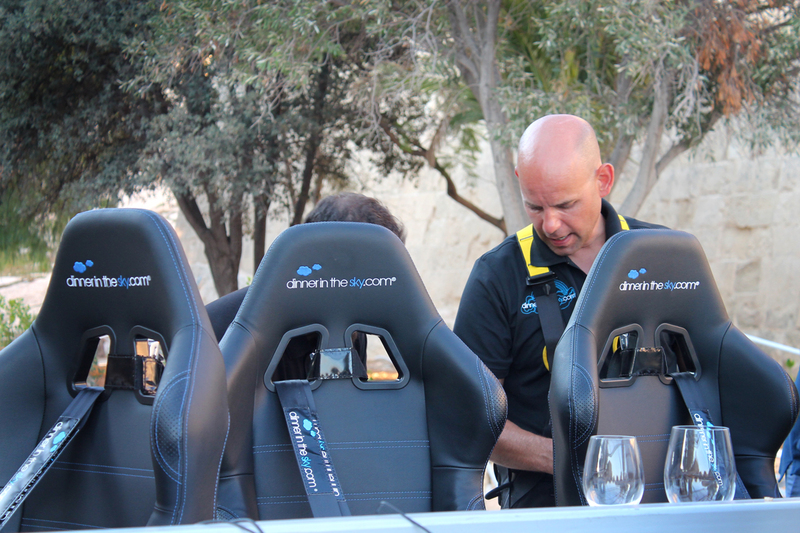 One of the management team Danny tells VIDA that he has been to Dinner in the Sky all over the world, and none have the impact of the view that Malta has to offer. 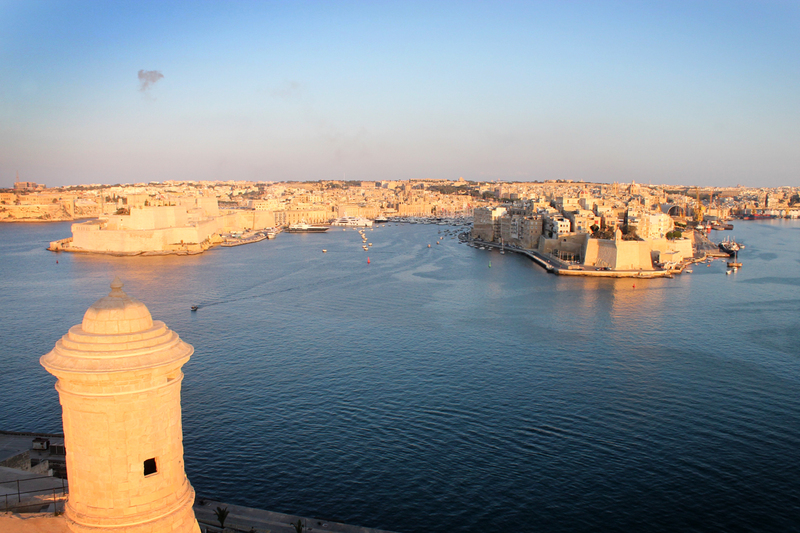 One of Malta’s most stunning views. 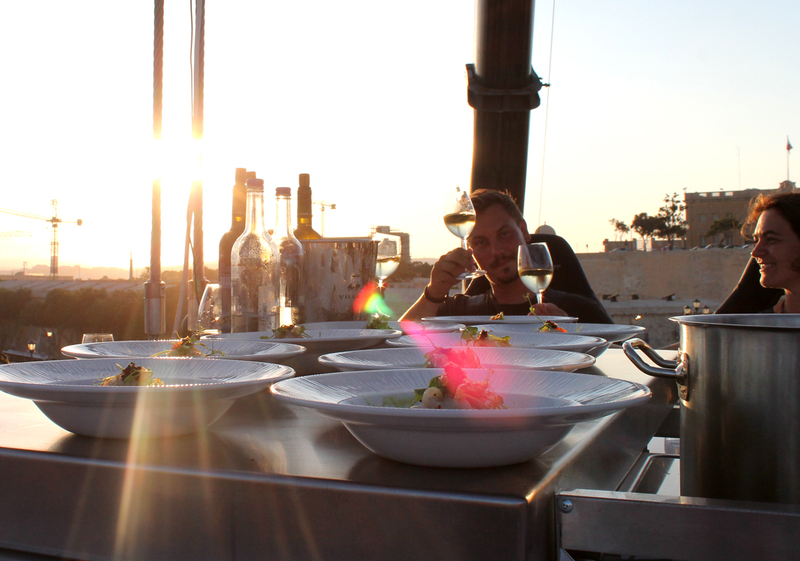 Dinner In The Sky has two sittings per evening. The 6pm sitting provided the perfect opportunity to enjoy the spectacular sunset. 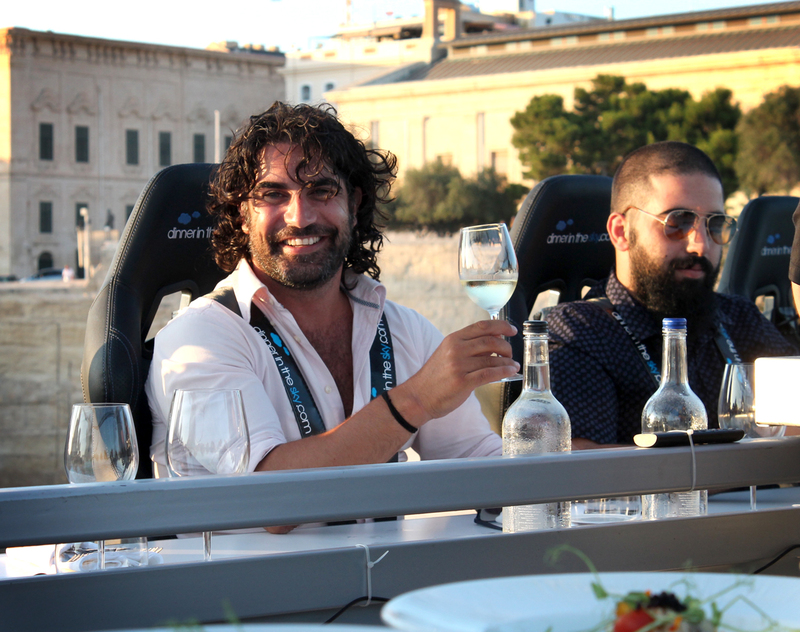 Xandru Grech, part of the team, kept the Press Guests entertained on the night.